My name is Bob Masserang and I have a disease. I also have a wonderful wife, Judy, who is married to me and my disease. 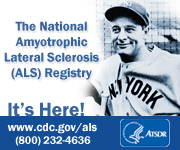 Amyotrophic Lateral Sclerosis, ALS or "Lou Gehrig's disease". No matter how you say it, it can be depressing, deflating and, in the end, deadly - the 3 D's. I was given the news that I had ALS in October 2006 - the day that the Tigers lost the World Series. It was a double-whammy kind of day. I waited until the next day, and over a bottle of wine, told Judy my news. It took us about six weeks and 14 boxes of Kleenex and two cases of wine before we could begin to talk about it with our family. Facing the prospects of ALS makes you feel rather hopeless since there is no cure and there are very limited treatment options. But, life doesn't come to an end with the diagnosis. Our mantra has become, "It is what it is, so just deal with it". Our other mantra is, "Life is too short to drink cheap wine". Early on, we were counseled by a very wise minister/friend that it is not unusual for people to pull away when hearing news of another person's disease. He said it was partly because it can make them feel helpless and struggle to know what to say or do for that person. This is especially true with ALS. So we announced "the disease" (as we now refer to it) in a letter, which was also an invitation to a party to celebrate our 25th anniversary. It was a great party and our friends and family saw we were still OK even though we have ALS. For the person with ALS, looking forward to seeing and hearing from friends and family provides that spark of hope and enthusiasm for the future that is vitally important. Over the past year, the disease has progressed in subtle ways. I've lost movement and strength in my arms. It became hard to comb my hair, so I got a buzz cut. My balance is not real good, so I use a cane and a walker. The next step will probably be to use a wheelchair. When I can no longer climb steps, we will have to once more change how we live. Last month, I had to give up the job of taking out the trash. Some jobs I feel okay about losing! But it still means someone else has to do it for me, and that can be demoralizing. That's when the support services provided by ALS of Michigan become so very valuable. They have vast experience with the disease and are a source of information and support to their pALS. ALS of Michigan provides counseling, referrals, various support groups and respite care services - all at no cost to pALS. They maintain a loan closet with walkers, wheelchairs and other equipment. I borrowed one of their wheelchairs for the Walk 'n Roll for ALS, one of the major fundraising events sponsored by ALS of Michigan. We had no idea what to expect when we signed up. My team of family and friends, called Bob's Masserangers, raised over $21,000. Needless to say, Judy and I were completely overwhelmed by the generosity, the care and the concern shown by so many people at the Walk. I am equally impressed by people who are willing to plan and stage an event like this. To me, it's more than just people coming together for a day or an evening to have fun and to raise some money. From my view, it's more about people caring and sharing of themselves to support the work of ALS of Michigan, which is so important to me and other pALS right here at home in Michigan. Thank you for welcoming me and Judy into this very special family.